The growth of Amazon.com and e-commerce in general is bolstering the fortunes of Rockford, Ill.’s Chicago Rockford International Airport (RFD) and two air cargo carriers that use the airport, elevating the profile of a facility that must compete for air traffic with the Windy City’s dominant O’Hare International Airport. The Rockford airport vaulted to the 22nd spot in the ranking of airports by cargo volume in 2017, up from a ranking of 31 in 2016, according to the Federal Aviation Administration’s preliminary ranking of cargo airports by landed weight. The airport moved nearly 1.4 billion pounds of cargo last year, up about 50% from 923 million in 2016. This year it has already moved 996 million pounds of landed freight through June. 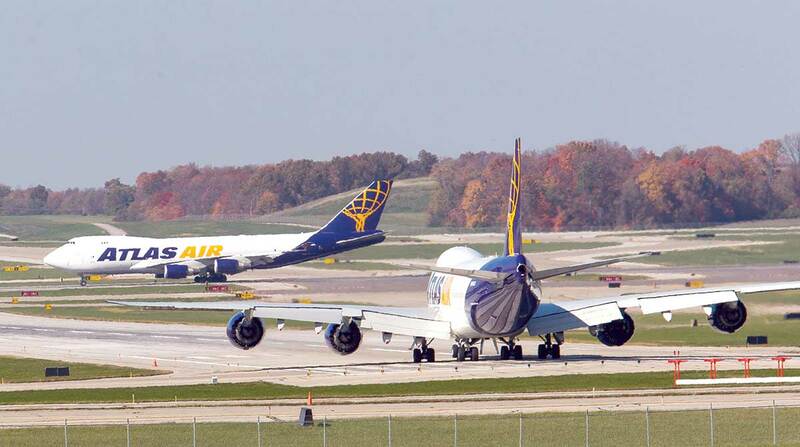 E-commerce volume at RFD grew 20% in 2016 and 2017 due to its 10,000- and 8,200-foot-long runways, wide taxiways that can accommodate Boeing 747-8 and Airbus 380 cargo planes, a 90-minute drive to O’Hare and access to consumer-rich suburban Chicago, Dunn said. Amazon is an important user of RFD as it seeks to find airport locations that get it close to consumers for its one- or two-day delivery programs. To do that, Amazon signed separate but similar deals in 2016 with two air freight carriers — Atlas Air Worldwide and Air Transport Services Group. Each firm agreed to lease 20 jets to the retailer and provide crews, maintenance and other services while Amazon hired them to move its freight. Atlas Air ranks No. 3 on the Transport Topics list of the top 25 U.S. air cargo carriers. Air Transport ranks No. 6 on the list. In return for Amazon’s business, each airline issued to the retailer warrants that give it the right to purchase a large chunk of their common stock for a set price within a set time period. The agreements are unusual but they bring Amazon’s growing business to the air carriers while giving the retailer the opportunity to share in their growth, said Jack Atkins, managing director and stock analyst with Stephens Inc., who follows Atlas and ATSG. “Amazon brings substantial value to the companies and it wants to take part in their growth,” said Atkins who notes that shareholders for Atlas and ATSG approved the deals. ATSG agreed to grant Amazon the right to buy 19.9% of its shares at $9.73 per share through March 8, 2021, in a multistep process that required Amazon to meet certain thresholds in using ATSG’s equipment and services. ATSG shares were trading around $23 recently. The company informed investors that Amazon provided about 28% of its revenue from continuing operations in the first quarter of 2018, according to a filing with the Securities and Exchange Commission. Atlas and Amazon also agreed to extend the relationship. Atlas granted the retailer warrants giving it the ability to purchase an additional 10% of its shares at $37.50 a share by May 4, 2023, again contingent on Amazon meeting certain usage thresholds. Atlas shares were trading around $67 recently. Dan Loh, Atlas senior director of investor relations, said the company’s shares were trading around $38 when the deal was signed, and that the firm has “grown significantly” since then, in large part due to its business with Amazon. An Amazon e-mail response referred questions to its website.